When he was ready, His Holiness told the audience that he would read through what remained of the text. “Whatever the topic of the discourse may be, the teacher should have a correct motivation, as should the disciples. It’s not appropriate for the teacher to expect money or other rewards for teaching, and disciples should set aside any inclination to cheat, exploit or bully others. “When it comes to taking refuge in the Three Jewels, faith has three aspects: admiration, conviction and aspiration. The aspiration, for instance, is to become a jewel of refuge yourself. When your practice is influenced by taking refuge in the Three Jewels it becomes Buddhist; when it is influenced by bodhichitta it belongs to the Mahayana. Let’s recite the standard refuge and bodhichitta prayer together. “In this verse ‘generosity and so forth’ includes wisdom as one of the other perfections. And if you think about the ‘I’ that turns for refuge, you’ll find it’s not part of the psycho-physical aggregates, but not separate from them either. The self is not independent, because it exists as a designation on the basis of the aggregates. “This chapter of ‘Guide to the Bodhisattva’s Way of Life’ http://www.sangye.it/altro/?p=4145 on meditation includes instructions for developing single-pointed concentration. What does that mean? It’s when you can focus without distraction on whatever object you have chosen. Not only can you focus without distraction, but your mind is also free of dullness and excitement. The mind is alert. Several meditators have told me that after spending time in meditation retreat, their minds seemed duller than before—because they had succumbed to dullness. “If you are able to cultivate single-pointed concentration, you can activate your wind energy and achieve physical and mental pliancy. You can apply your concentration to your analytical meditation, which is how you can achieve penetrative insight. These practices are shared with non-Buddhist Indian traditions. Those practitioners are more intent on accessing the higher domains of existence, like the form and formless realms, which are subtler than this coarser desire realm. I hope to attend a Khumba Mela to meet some of these meditators and hear about their experiences. “In Buddhist practice, we use transcendental penetrative insight to determine ultimate reality and, with the support of bodhichitta, we use that insight to eliminate our mental afflictions and obscurations to knowledge. The more familiar we become with selflessness, the more our sense of attachment and so forth is reduced. Seeing some Theravada monks in the crowd, His Holiness invited them up onto the stage. He resumed his reading of Chapter 8 of the ‘Guide’ at verse 157. Observing that things appear to have objective existence, he affirmed that when he looks at someone else, they look as if they exist independently. Likewise, when they look at him, it looks to them as if he exists objectively. If this were true, it should be possible to find this independent or objectively existent person if you looked for it—but it can’t be found. His Holiness soon completed Chapter 8. In relation to Chapter 9, which concerns wisdom, he remarked that to overcome fundamental ignorance we have to understand ultimate reality. Wisdom is the aspect of intelligence that sees things as they really are. He mentioned the Two Truths—how things appear and how they really are. He clarified that those who realize emptiness still engage with the conventional world. For example, they still feel hunger and thirst. Things exist as dependently arisen, so it is not their existence that is being denied, but their existence as independent and intrinsic entities. He cited verse 25 in support of this. Is not to be negated. That is to be rejected. His Holiness stopped at verse 40, announcing that he would complete reading the book next year and that he was today going to give a Long Life Empowerment. “We have more than 300 volumes of the Kangyur and Tengyur to study,” he remarked. “Buddhism is about understanding reality and transforming your mind, not through prayer, but through reason. We need to study, reflect and meditate while we are alive and able—and for that reason it’s good to have a long life. 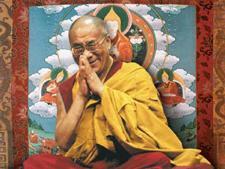 During the course of the empowerment His Holiness led the gathering in taking the bodhisattva vows. When the empowerment was complete, he also gave transmission of the mantras of the Buddha, Avalokiteshvara, Manjushri, Tara and Hayagriva. Tsewang Thinles approached the throne to offer His Holiness a white scarf. His Holiness thanked him and playfully tapped his fist on the LBA President’s head. He descended the throne and once more walked to the front of the stage to wave goodbye to the crowd. Thousands of hands waved back. He returned to the Shewatsel Phodrang in a car. 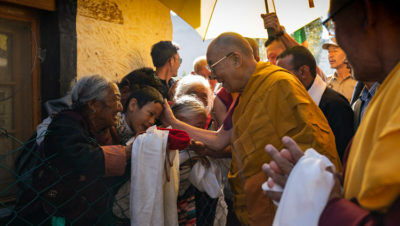 Tomorrow he will speak to Tibetans resident in Ladakh, who will assemble at the local Tibetan Children’s Village School.